After enjoying recent visits to Gdansk and Warsaw we decided to spend a weekend in Wroclaw, Poland’s fourth largest city. Ryanair were offering low cost flights from Leeds-Bradford Airport on a Friday evening, enabling us to enjoy two full days in south western Poland. 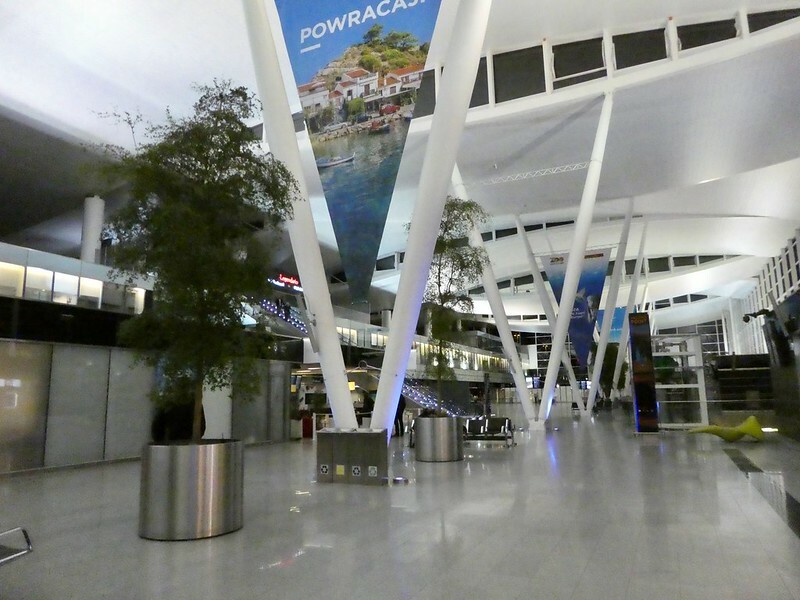 Our flight departed on time and in a little over two hours we arrived into Wroclaw-Copernicus airport. It’s a small but efficient airport and within minutes of landing we were boarding a bus into the city centre. Passengers can either take the Airport Express service , journey time 30 minutes (10zl) or the regular bus service 106 /206 which takes an extra 10 minutes but only costs 3.80zl (80p). We opted for the latter, buying our tickets from a machine at the bus stop but these can also be purchased by card payment on board the bus. The bus terminated at the railway station and conveniently for us, it was just across the road from our hotel the Ibis Styles Wroclaw Centrum. This modern hotel, with an Alice in Wonderland theme, had an attractive entrance foyer with complimentary tea and coffee for hotel guests. After quickly checking in, we took the lift to our spacious room on the third floor which had large windows overlooking a quiet side street and was just perfect for our weekend break. 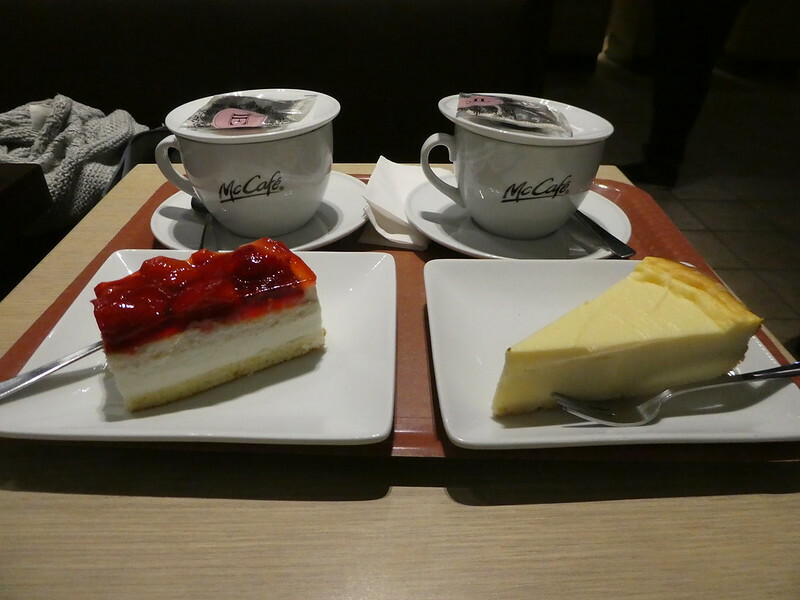 After settling in, we popped across to the McCafe in the station for late night tea and cakes before getting a good night’s sleep in preparation for the day ahead. Our day started with a varied selection of dishes in the light and airy breakfast room which continued with the Alice in Wonderland theme. The floor resembled a chessboard whilst the walls had cheerful Queen of Hearts wallpaper. 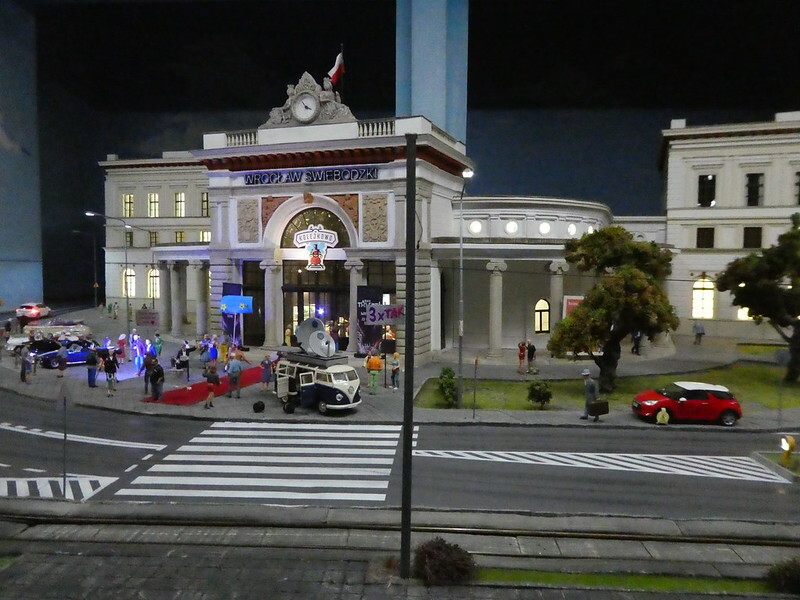 After several cups of coffee, we set off on foot to Kolejkowo, the largest model railway in Poland. 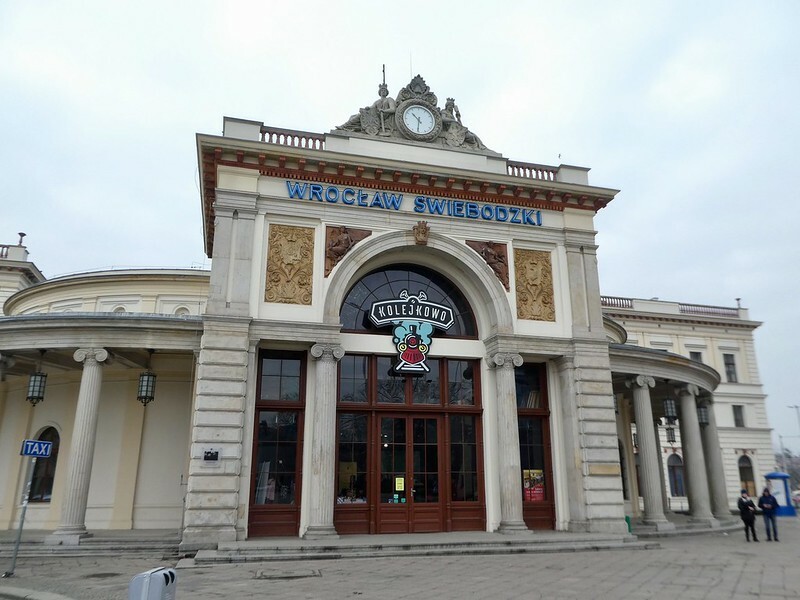 It is located in the old Swiebodzki railway station, not far from the historic old town. We were so eager to visit the model railway that we actually arrived ten minutes before it opened and had to wait patiently outside along with some excited school children. Adult admission is 19zl (£3.78) a small price to pay to enter this enchanting miniature world. An advantage of arriving early meant that we could walk around and admire the exhibition before it started to get busy. 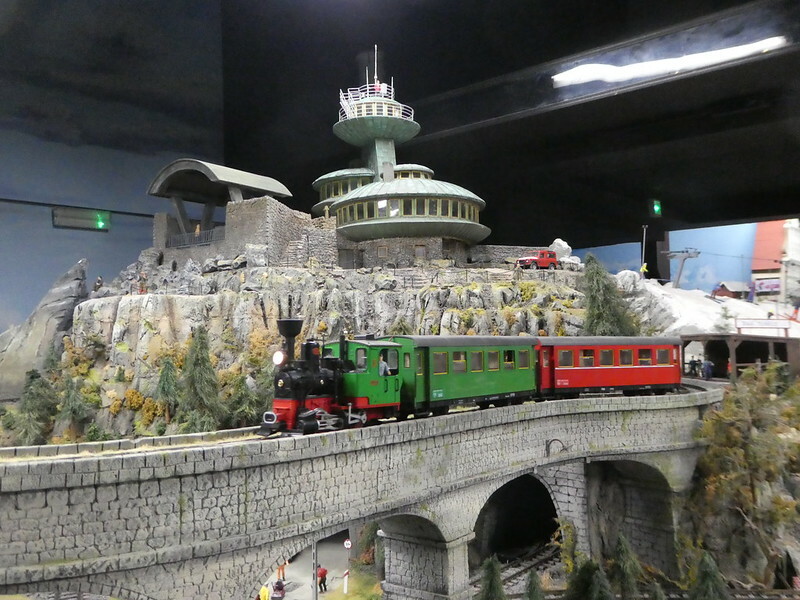 Arranged on two floors are 510 metres of track, 15 trains and 60 carriages all beautifully landscaped with bridges, tunnels and streams. The exhibits feature local landmarks around Wroclaw and Lower Silesia, including the Old Town Market Square with its colourful houses. The displays are illuminated and periodically dim to simulate evenings when street lamps and lights in apartments can be seen. 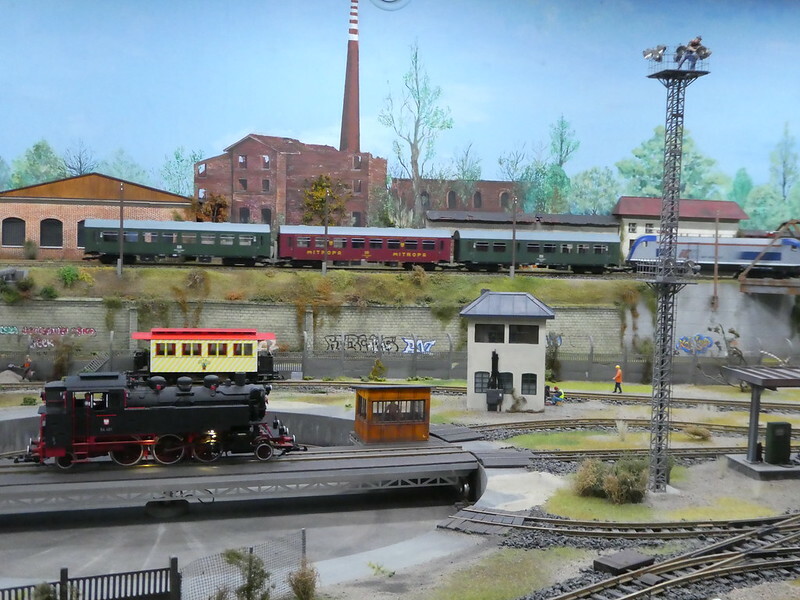 Creating the model railway has been a labour of love with around 160 buildings and over 2,000 intricately sculpted figures of people and animals arranged in varied settings. These include skiers, hikers, farmers and construction workers on a building site. As well as model trains, there are over 200 Scalectric automated vehicles taking patients to the hospital, driving to the station and picking up passengers at the bus stop. 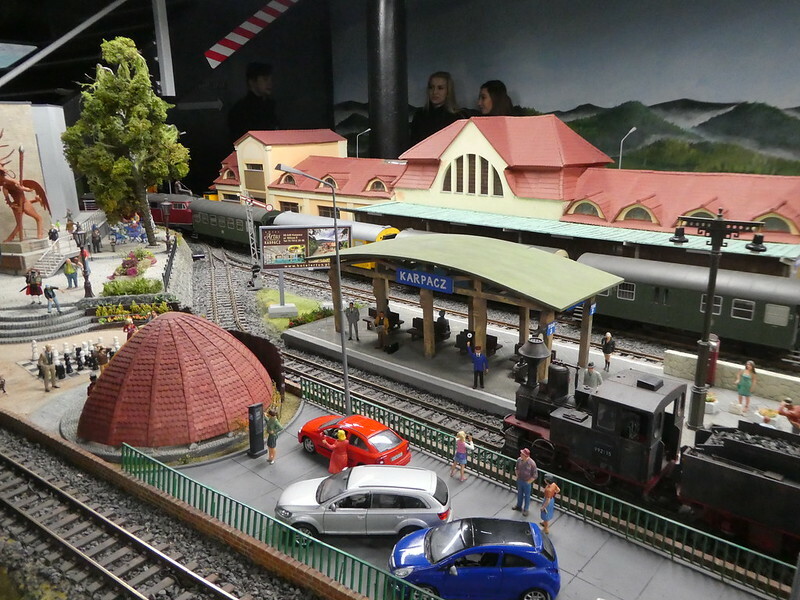 Viewing the model railway was an enthralling experience and an absolute pleasure for all ages. Leaving the miniature world behind us, it was a ten minute walk to the old town historical centre. Along cobbled streets we discovered the city’s most beautiful architecture. The market square was painstakingly reconstructed in the 1950’s to its former Baroque splendour after suffering damage during the Second World War. 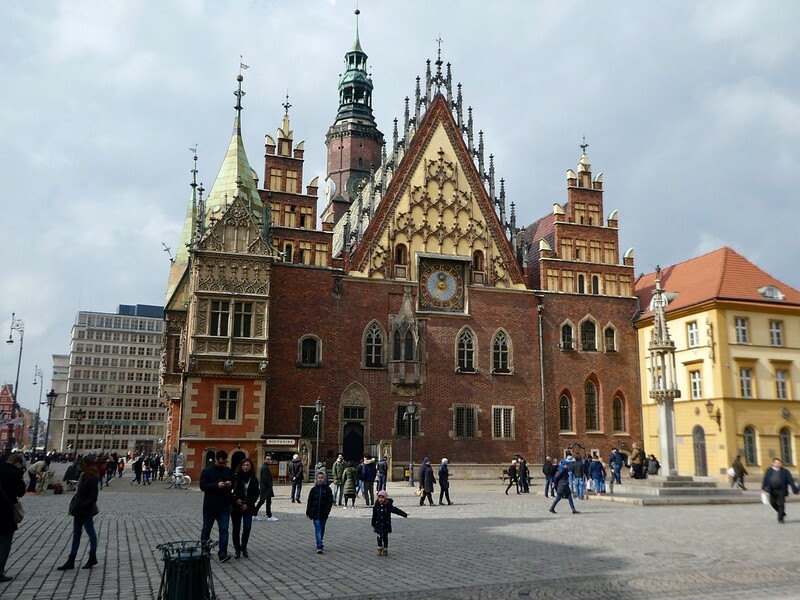 The magnificent old city hall stands proudly in the market square with parts of the building dating back to the 13th century. 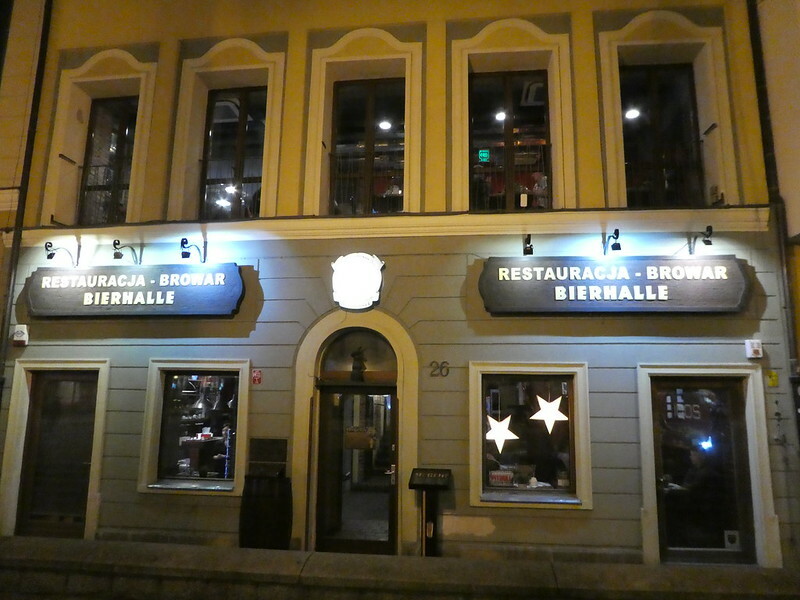 It is still used for civic and cultural events and houses a museum, with one of Europe’s oldest restaurants in the basement. Ready for some lunch, we chose Pierogarnie, one of the pubs overlooking the square. It was already busy but fortunately we were shown to one of the remaining tables on an upper balcony. We both decided to have large bowls of soup, which came served with chunky slices of rye bread and pickled gherkins. The pub had a friendly atmosphere and our soup was thick with plenty of vegetables. There are over 300 of them in Wroclaw but it took us awhile to start noticing them as we needed to be observant to seek them out. Each gnome is engaged in a different activity from reading a book, counting on an abacus, sheltering from the rain to studying at the university. A map can be obtained from the Tourist Information office identifying their locations for those intent on tracking them all down. 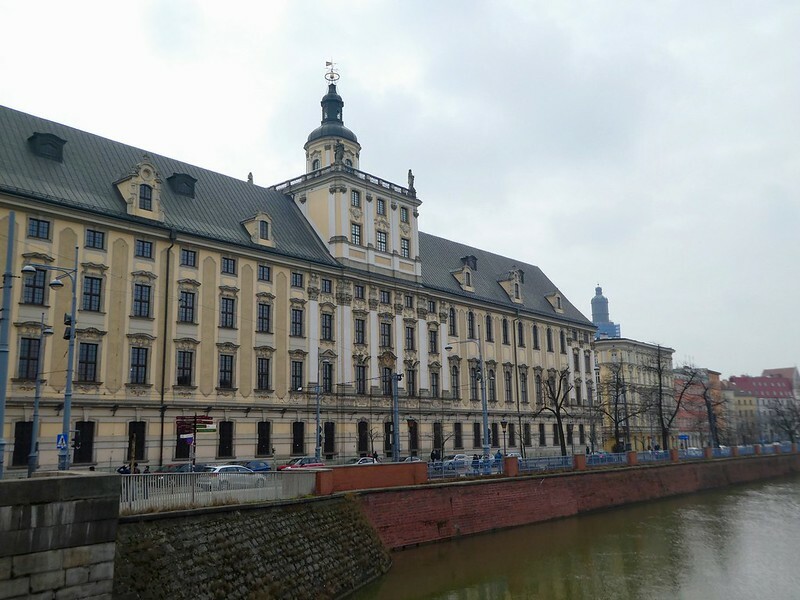 Reaching the University of Wroclaw, we admired the Baroque main building which was founded by the Jesuits in 1670. The university has produced 9 Nobel prize winners and specialises in scientific research. As we had walked quite a distance, we then decided to buy a 24 hour public transport ticket costing 11zl (£2.30) each which would still be valid for use on our journey back to the airport the following day. 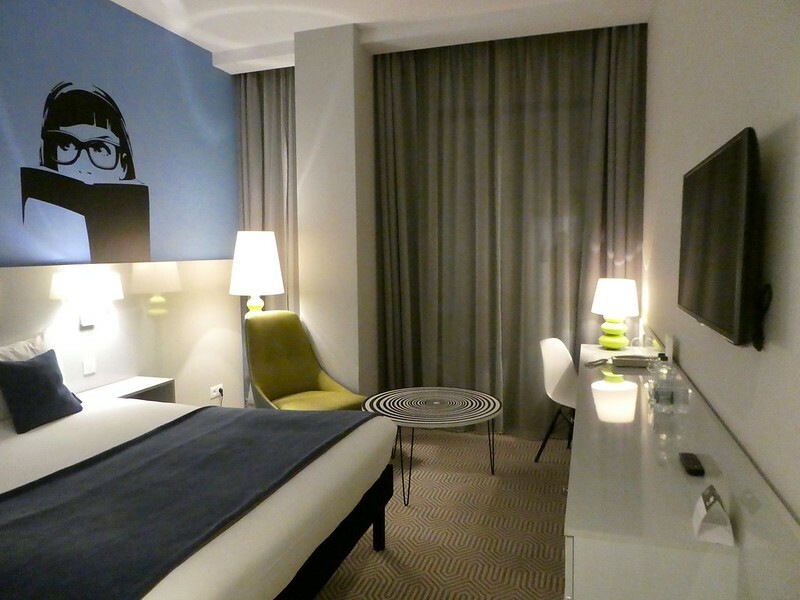 After validating our tickets on board a tram, we returned to the hotel for a short rest. Later, we returned to the old town square which was bustling with activity as it was a Saturday evening. After strolling around taking in the atmosphere, we spotted Bierhalle, a local micro-brewery. Climbing two flights of stairs to its restaurant, we were expecting it to be full but we were fortunate to be shown to one of the few remaining tables. 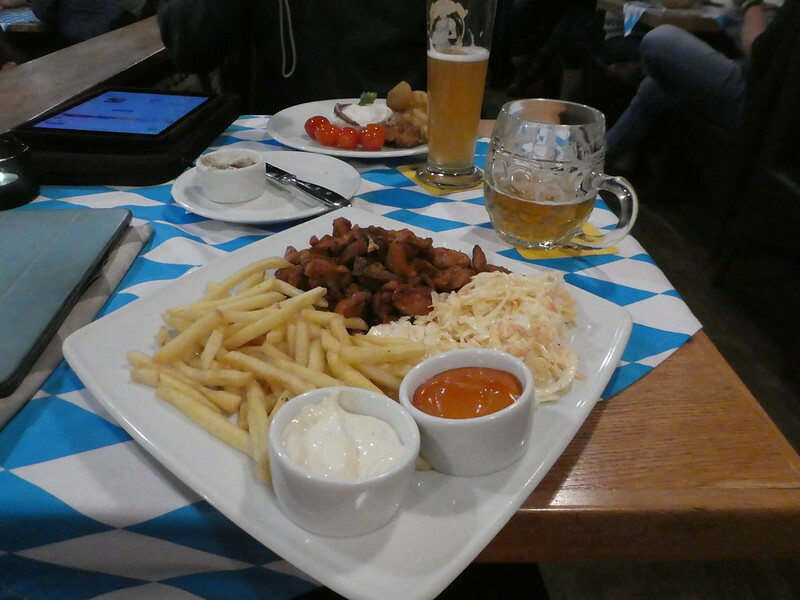 We ordered main courses of spicy chicken and pork schnitzel with glasses of wheat beer and lager to accompany our meal. As it was very busy we were advised the food would take 30 minutes to arrive but that suited us well, as we weren’t in a rush and could relax with our drinks. The Bierhalle portions were large so we needed a little walk after our meal before returning to the hotel where we enjoyed late night cups of tea in the hotel’s lounge before bed. I visited this place twenty years ago and left it in a hurry at dawn the next day. I was still living on a boat and the riverside was swarming with all kinds of marginals (mostly Gypsies), just waiting for me to leave my boat so they would be able to break in. Luckily I had three passengers at that time, so I hadn’t to confront them alone. At a certain moment the situation became so tense, that they started to cut my mooring ropes. I decided to anchor in the middle of the river, whereupon THEY called the police to denounce me for not being properly moored at the riverside. So the police came and ordered me to moor again to the riverside. I explained them the situation; but no avail. So we mounted a watch for the whole night. They still managed to steal my flag from the stern of the boat (I should have taken it in for the night, but forgot with all this upheaval). We moved on to Bydgoszcz, where we had a great time. Oh dear, what an experience you had in Wroclaw all those years ago. It’s good to hear you were unharmed and managed to move on to safer waters. Nice one…surely you had wonderful time and the pics are amazing and well captured and they are evidence that you were in the enjoyable atmosphere. Thank you for your kind words. 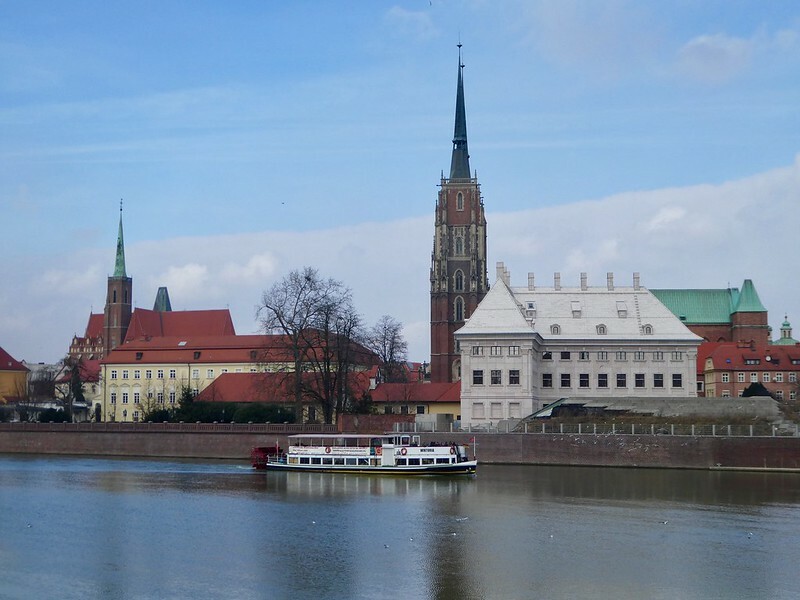 It’s so nice to read that you have enjoyed this post on my visit to Wroclaw. Thank you for your kind words. I’m glad you liked the photos. All four cities that I’ve visited in Poland have been architecturally beautiful so I don’t think you can go wrong! Love the gnomes and the buildings are beautiful. I’m off to Krakow tomorrow for my first visit to Poland. Thanks Samantha. 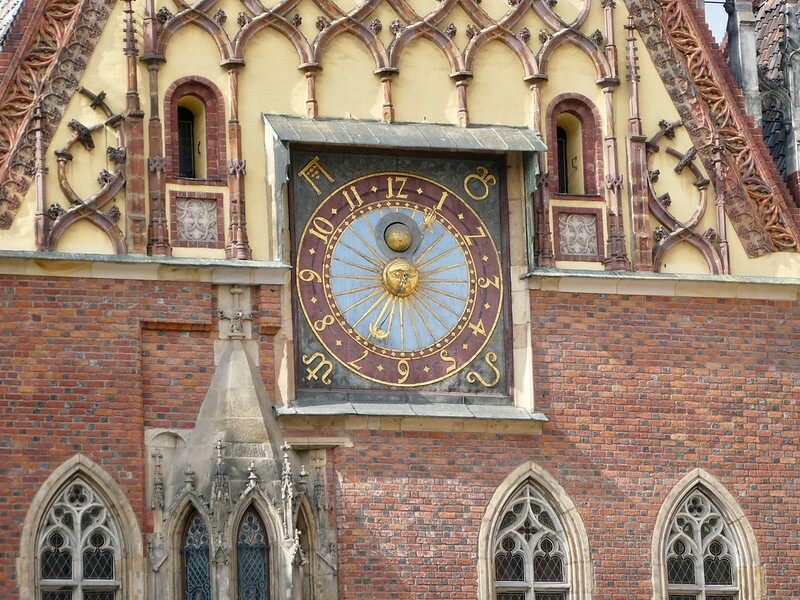 You’ll love Krakow – have a great time! Thank you Henika, I thought that Wroclaw was beautiful too. You certainly do make the most of your life Marion; what a wonderful two days. Lovely to see such fabulous places M.
I really enjoy the way you illustrate your tour with high quality pictures. I spend time studying these. My sister in law who was married to an Australian with Polish background recently visited Poland to meet her husband’s extended family for the first time. She had a very good time there. Wroclaw is now the fourth Polish City I’ve visited and I’ve enjoyed each of them. The architecture is absolutely beautiful and the people friendly Ian. Thank you for your inspiring thoughts Ian. Marion. Thank you Misha for your kind words. It’s great to hear that you enjoyed reading this post. It’s my pleasure, thank you for your kind words. Gdansk is absolutely beautiful Suvi, you’ll both have a lovely time! Lovely post girl, this sounds like a lovely little getaway and the gnomes are so cute omg!! I’d defo have to track them all down! Thanks Shannon for your kind words. 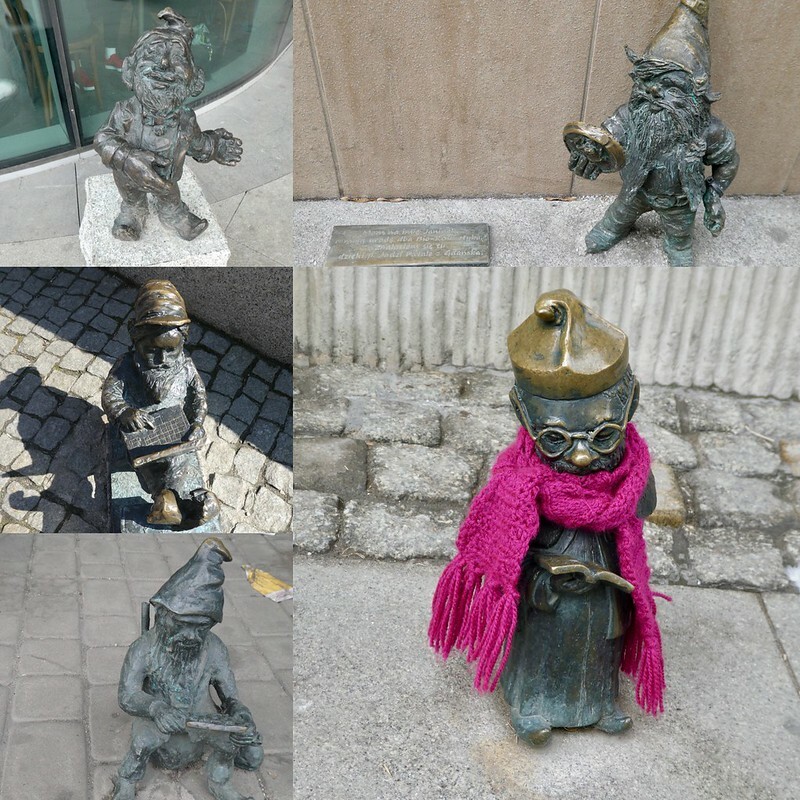 Those gnomes are just so cute tucked away along Wroclaw’s streets. What a lovely weekend. Poland is so lovely, I’m very envious of your proximity to Europe….being able to jump on a cheap flight for a getaway …sigh. its a long way to anywhere from Melbourne. Thank you for your kind words. Poland in indeed a lovely country with some delightful architecture. I’ve visited Australia several tines but have not yet made it to Melbourne. I’ve read so many nice things about the city, I would like to visit there sometime!